As a wedding videographer here in Tipperary, I encounter all the recent trends and changes in wedding styles, and in recent years the Vintage wedding has gained popularity. This is a look I see many brides and grooms aspire to. Another great reason to choose Abbey video to film your wedding is I have so many years of experience filming weddings and I have edited and enhanced so many wedding videos to help achieve this vintage look. The term vintage can be interpreted to mean so many things, but I think it’s best to think of it as retro and as a reference to a specific bygone era. Imagine Hollywood glamour from the 1920’s, fifties style with short wedding and bridesmaid dresses, or the fashion from 60’s mods. For many, vintage can also mean rustic, country, shabby chic or simply a crafty and DIY quality. If this is a look you would like to reflect on your wedding day, it is best to choose a specific era and stick to it or make sure to limit the number of vintage references. If you choose too many details and want to include every detail you like, the wedding may begin to feel overdressed and fussy, the opposite of what you are trying to create, which is aseemingly effortless and easy style. I think here in Ireland, the look can be easily accomplished as we have so many old and atmospheric venues to choose from.Once you have chosen your venue, this is the best time to think about the finer details which will help to achieve the vintage look and feel you desire. Discuss your options and ideas with the hotel or events manager and ask if they have any pictures from previous weddings they’ve hosted to see what will work and if there are any definite no-nos. They will have an idea of what will work in the space. It’s in their interest that the venue looks its best as they are eager to entice further business and new clients at every event they host. Some decorative details will not work in all surroundings, for example bunting and jam jars will create a great ambiance in an outdoor tent, however the look may not translate as well in the fine dining room of a high-end hotel. The vintage look can be easily incorporated into the outdoors in the form of signage on chalk boards, or possibly an old bicycle with the wedding flowers arranged in the basket at the hotel entrance. A selection of coloured jam jars wrapped in lace and secured with a ribbon make beautiful candle holders or vases for flowers. 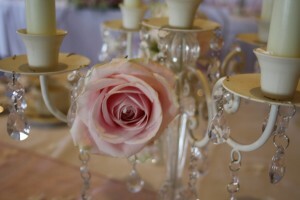 Old silver teapots filled with fresh flowers can add the rustic feel to the reception area where the guests arrive. Canapés can be served on old silver platter dishes. Menus and invites can be rolled into scrolls and wrapped with a ribbon, echoing one of the focal wedding colours. Colourful bunting used outdoors or above the increasingly popular sweet carts can add fun to the occasion and keep the younger guests entertained. If renting a sweet cart is not within your budget, an old dresser decorated with bunting will make a beautiful addition. Sweet jars can be purchased from discount shops for only a few euro. If you crave the decadent look of 1920’s Hollywood glamour, think of lace table cloths, and elaborate crystal candelabras. Brides especially will ask me to include shots of the finer details of their wedding day. I can begin a segment of footage with a big fat close up of their vintage ideas so your efforts can be remembered for many happy years to come! Please get in touch should you like to discuss any details regarding wedding videography for your upcoming wedding. I’d love to hear from you. Also check us out on Facebook, loads of special offers and fun ideas! We supply pick ‘n’ mix candy stands for all your special occasions. Ideal for birthday’s, communions, confirmations, weddings or any special event you may have. Our stand comes with the original Red & White Candy Stripe paper bags, Silver Aluminium Scoops & Tongs. The sweets are displayed in 1.8l glass jars, each sweet selection = 1 jar. We also provide Red & White flavour cards for all your sweets. If you’re looking for specific sweets, please let us know and we will do our best to source same for you. For a list of our sweets, please go to the Sweet Selection Album in Photos. PLEASE BE AWARE THAT THE SWEETS ARE DISPLAYED IN GLASS JARS AND THEREFORE ADULT SUPERVISION IS REQUIRED AT ALL TIMES. ALSO PLEASE NOTE THAT SOME SWEETS MAY NOT BE SUITABLE FOR CHILDREN, PLEASE BEAR THIS MIND WHEN MAKING YOUR SWEET SELECTION IF THERE IS ANY ALLERGY INFORMATION DISPLAYED ON THE PACKAGING OF THE SWEETS YOU CHOOSE, WE WILL ALSO LEAVE THIS INFORMATION ON OUR CANDY STAND FOR YOUR GUESTS. Copyright © 2019 Brides in Tipperary Munster. Powered by WordPress. Theme: Accelerate by ThemeGrill.